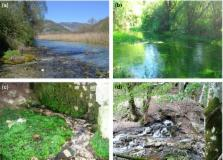 We investigated whether the equilibrium theory of island biogeography (ETIB) can be applied to the meiofauna of groundwater‐fed springs. We tested whether copepod species richness was related with spring area, discharge, and elevation. Additionally, five hypotheses are tested based on species distribution patterns, dispersal ability, and life‐history characteristics of several guilds (stygobiotic, nonstygobiotic, cold stenotherm, and noncold stenotherm species). Thirty springs in the central Apennines (Italy) were considered. A multimodel selection procedure was applied to select best‐fit models using both ordinary least‐squares regressions and autoregressive models. Mantel tests were used to investigate the impact of spatial autocorrelation in determining interspring similarity (ßsor), pure turnover (ßsim), intersite nestedness (ßnest = ßsor − ßsim), and matrix nestedness (measured using NODF and other metrics). Explicit consideration of spatial correlations reduced the importance of predictors of overall species richness, noncold stenotherm species (both negatively affected by elevation), cold stenotherm species, and nonstygobiotic species, but increased the importance of area for the stygobiotic species. We detected nested patterns in all cases, except for the stygobites. Interspring distances were positively correlated with ßsor and ßnest (but not with ßsim) for the entire data set and for nonstygobiotic, cold stenotherm, and noncold stenotherm species. In the case of stygobites, interspring geographical distances were marginally correlated with ßsor and no correlation was found for ßsim and ßnest. We found support for ETIB predictions about species richness, which was positively influenced by area and negatively by elevation (which expresses the size of source of immigrants). Low turnover and high nestedness are consistent with an equilibrium scenario mainly regulated by immigration and extinction. Stygobites, which include many distributional and evolutionary relicts, have a low capability to disperse through the aquifers and tend to be mainly confined to the springs where they drifted out and were trapped by springbed sediments. The nested assembly of plant-animal mutualistic networks. Most studies of plant-animal mutualisms involve a small number of species. There is almost no information on the structural organization of species-rich mutualistic networks despite its potential importance for the maintenance of diversity. Here we analyze 52 mutualistic networks and show that they are highly nested; that is, the more specialist species interact only with proper subsets of those species interacting with the more generalists. This assembly pattern generates highly asymmetrical interactions and organizes the community cohesively around a central core of interactions. Thus, mutualistic networks are neither randomly assembled nor organized in compartments arising from tight, parallel specialization. Furthermore, nestedness increases with the complexity (number of interactions) of the network: for a given number of species, communities with more interactions are significantly more nested. Our results indicate a nonrandom pattern of community organization that may be relevant for our understanding of the organization and persistence of biodiversity. Regression analysis of spatial data. Many of the most interesting questions ecologists ask lead to analyses of spatial data. Yet, perhaps confused by the large number of statistical models and fitting methods available, many ecologists seem to believe this is best left to specialists. Here, we describe the issues that need consideration when analysing spatial data and illustrate these using simulation studies. Our comparative analysis involves using methods including generalized least squares, spatial filters, wavelet revised models, conditional autoregressive models and generalized additive mixed models to estimate regression coefficients from synthetic but realistic data sets, including some which violate standard regression assumptions. We assess the performance of each method using two measures and using statistical error rates for model selection. Methods that performed well included generalized least squares family of models and a Bayesian implementation of the conditional auto-regressive model. Ordinary least squares also performed adequately in the absence of model selection, but had poorly controlled Type I error rates and so did not show the improvements in performance under model selection when using the above methods. Removing large-scale spatial trends in the response led to poor performance. These are empirical results; hence extrapolation of these findings to other situations should be performed cautiously. Nevertheless, our simulation-based approach provides much stronger evidence for comparative analysis than assessments based on single or small numbers of data sets, and should be considered a necessary foundation for statements of this type in future. Islands as model systems in ecology and evolution: prospects fifty years after MacArthur-Wilson. The study of islands as model systems has played an important role in the development of evolutionary and ecological theory. The 50th anniversary of MacArthur and Wilson's (December 1963) article, 'An equilibrium theory of insular zoogeography', was a recent milestone for this theme. Since 1963, island systems have provided new insights into the formation of ecological communities. Here, building on such developments, we highlight prospects for research on islands to improve our understanding of the ecology and evolution of communities in general. Throughout, we emphasise how attributes of islands combine to provide unusual research opportunities, the implications of which stretch far beyond islands. Molecular tools and increasing data acquisition now permit re-assessment of some fundamental issues that interested MacArthur and Wilson. These include the formation of ecological networks, species abundance distributions, and the contribution of evolution to community assembly. We also extend our prospects to other fields of ecology and evolution - understanding ecosystem functioning, speciation and diversification - frequently employing assets of oceanic islands in inferring the geographic area within which evolution has occurred, and potential barriers to gene flow. Although island-based theory is continually being enriched, incorporating non-equilibrium dynamics is identified as a major challenge for the future. © 2014 John Wiley & Sons Ltd/CNRS. Simone Fattorini, Department of Life, Health and Environmental Sciences, University of L'Aquila, L'Aquila, Italy. Copyright statement: © 2016 The Authors. Ecology and Evolution published by John Wiley & Sons Ltd.
Metapopulation Tracking Juvenile Penguins Reveals an Ecosystem-wide Ecological Trap. Influence of spring and autumn phenological transitions on forest ecosystem productivity.